AUSTIN, Texas (CN) – The U.S. Army Corps of Engineers on Friday released a draft plan to build flood gates to protect the Houston Ship Channel from a hurricane-driven storm surge and restore Texas beaches to fight rising seas, with an estimated price tag of at least $23 billion. 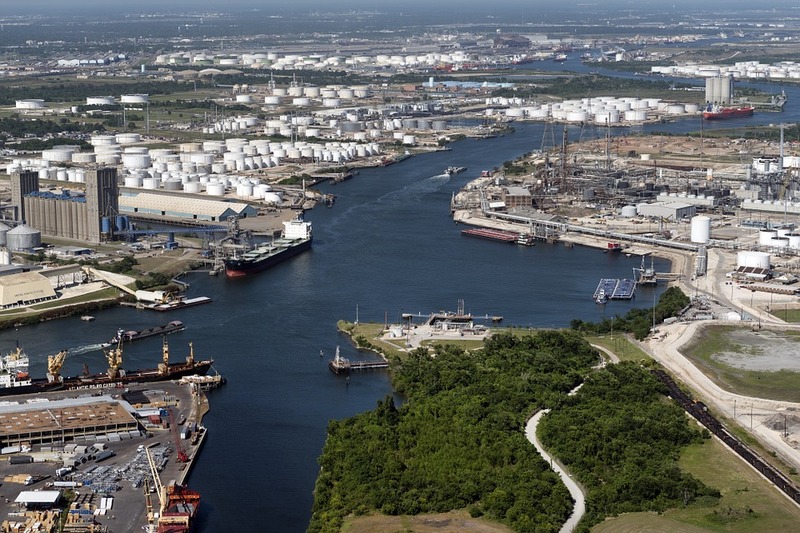 The Houston Ship Channel – the nation’s largest petrochemical complex and home to two of its biggest refineries with a combined production capacity of more than 1 million barrels of oil per day – is a sitting duck. Galveston, the island 50 miles southeast of Houston that’s the ship channel’s front door, is hit by a major hurricane every 18 years, according to the Army Corps of Engineers’ 442-page report. Though Hurricane Harvey is fresh in Texans’ memories, Harvey’s devastation came from its record-breaking rainfall as it stalled above Greater Houston in August 2017, not its winds. Hurricane Ike made landfall in Galveston as a Category 2 storm in September 2008 and caused more than $20 billion in property damage. Ike’s winds combined with Gulf of Mexico tides to push a 20-foot wall of water 30 miles inland in places, according to the report. Experts say Ike narrowly strayed from a path that would have destroyed the Houston Ship Channel and caused widespread environmental damage. The Army Corps of Engineers, partnering with the Texas General Land Office, said that in addition to building a surge gate to protect the ship channel, its tentative hurricane-protection plan calls for restoring beaches, sand dunes, oyster reefs, bird rookery islands, wetlands and marshes up and down the coast, as far west as South Padre Island at the southern tip of Texas off Brownsville. The agencies peg the plan’s estimated cost at $23 to $31 billion and said a final report will be released in 2021 before work starts. The environmental restoration is intended to slow down storm surges and address erosion, which claims 18 feet of shoreline each year in places on Texas’ 370-mile coast, according to the Associated Press. Texas Land Commissioner George P. Bush, son of former Florida Governor Jeb Bush, said in a statement that Texas refineries are vital to the national economy and praised the Corps of Engineers for prioritizing their protection. “Texas’ coast is home to one in every four Texans and 30% of the American oil refining sector resides here. The Coastal Texas Study is about protecting our people, our economy and our national security. The options selected are proven to be effective in mitigating the deadly effects of storm surge on our state,” Bush said. The government has already earmarked $3.9 billion for three smaller Texas coastal protection projects. According to the AP, one of those projects will involve installing six miles of 19-foot floodwalls around Port Arthur, a town of 55,000 that’s home to the Motiva refinery. The nation’s largest, it is owned by Saudi Arabia’s national oil company, Saudi Aramco. Texas must match 35 percent of the Corps of Engineers’ cost for the project under federal rules.